Kidnapping is one of the most common crimes in the Philippines. Hundreds of people are nabbed in the country every year. Perpetrators often do it to extract ransom money from the families of the people they nab. There are others who commit the crime for personal reasons like exacting revenge on people who wronged them. And there are others who do it to forcefully take people (like their children) who are not under their custody. 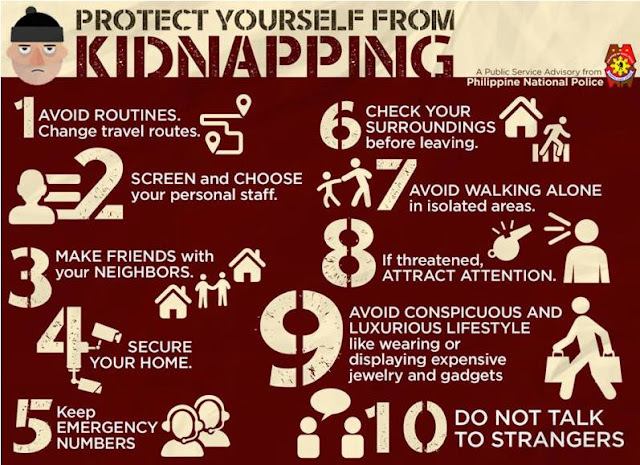 The Philippine National Police (PNP) has released the following public service advisory to teach people how to protect themselves from kidnappers. These tips were originally posted by the PNP on their official Facebook page. Read the tips and feel free to pass them along to people you know. 1. Avoid routines. Change travel routes. Most kidnappers stalk their victims before they nab them. They watch and learn about their daily routines. The time they leave their house to go to work. The time they return back home. What type of transportation they use. Kidnappers need to know these in planning when they will make their move. That said, in order to confound them, you need to change your travel routes and routines every now and then. 2. Screen and choose your personal staff. If you employ people, always screen them carefully before you hire them. Make sure that they have no prior criminal records. This is especially important if you are hiring people who will have access to your personal information. Verify the names of applicants if they are what they say they are. To put it simply, the more friends you have in your area of residence, the safer you will be. This is because you will have more people to run to in times of trouble. Furthermore, in the event that you get kidnapped, you have more friends in the neighborhood who will check on you in case they notice something amiss. Make your house as secure as possible. Some kidnappers do their acts at night when people are asleep. Suffice it to say that if entrances to your home are bolted and locked right, there'll be less chances for criminals to get in. If you can afford it, try installing alarm systems and CCTV cameras in different portions of your home. Always have with you emergency numbers from appropriate departments like the local police force. If you personally know a person who is a policeman or anyone working in the defense department, keep his/her number with you as well. If you can, try memorizing the emergency numbers for easier and faster access. 6. Check your surroundings before leaving. Before you leave your house or your office, look around you and see if there's something amiss. Is there an unfamiliar car parked near your home? If you notice that something doesn't seem right, be more cautious or contact the authorities if need be. 7. Avoid walking alone in isolated areas. This is especially true at night. As was mentioned earlier, a lot of kidnappers do their act under the cover of darkness. If you use a car and go home late at night, always park it in a well-lit area. If you are walking home, have a companion with you and avoid routes that are not well-lit. 8. If threatened, attract attention. If someone suddenly threatens you, your best course of action is to attract attention from people nearby. You can run towards crowded areas. If the person got hold of you in that you can't possibly run, then shout as loud as you can. 9. Avoid conspicuous and luxurious lifestyle like wearing or displaying expensive jewelry and gadgets. A lot of kidnappers are in the business of nabbing people to enrich themselves. They can either rob the people they nab or demand ransom money from the families of their victims. With that said, don't catch the attention of kidnappers by unnecessarily displaying your wealth. 10. Do not talk to strangers. Always observe caution when talking and interacting with strangers. Keep your eyes open and your mind alert. If you notice something fishy, get out and distance yourself.